One of our favourite weekend family breakfasts is pancakes. Not the thin crepe-style pancakes, but the thick, light-as-air ones, stacked and oozing with syrup. Put all ingredients into a blender or food processor and whizz till well blended. You may need to scrape down the sides of the jug/bowl after a few seconds to ensure all ingredients well mixed in. Leave for 20 minutes. Fry pancakes in a buttered pan. Not too hot though or the butter and first side burn before you have a chance to flip it over. Remember that when the top side of pancake is bubbling it’s time to flip. It’s that time of year. But in my book, any time of year is fine for these babies. I make them all year round. I just dont put crosses on them if it’s not Easter because a) I’m too lazy, and b) …well actually a) pretty much covers it! I like my easter buns with fruit, not this modern day chocolate chip nonsense. I have made them with chocolate chips (use cocoa instead of spices, and choc chips instead of fruit) but I am so over chocolate, and they just dont taste right with butter. 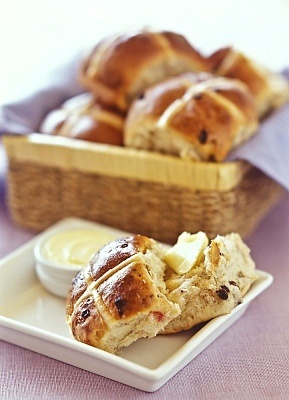 Hot X Buns NEED butter. It’s the law. Seriously. If you want to have them for breakfast, just set your alarm clock two hours earlier and slave away in the kitchen while everyone else slumbers. OR you can make the dough the day before. After the dough has risen and you punch it down, you can then put the dough in the fridge (or shape it into the buns and place on a tray first). Just bring it out in the morning and place in a warm spot for half an hour before placing in the oven. Also this recipe has the method for using a mixer… but my mixer is too gutless for heavy dough mixtures so I do it by hand. Just knead away for 5 minutes adding flour to stop dough sticking. Finally, if there are three hungry teenage boys (and many more hangers-on) in the house, you may need to wear protective body armour when these come out of the oven. Combine first 5 ingredients in a small bowl and allow to stand in a warm place until mixture begins to froth. (about 10 mins). Insert dough hooks into the mixer. place sifted dry ingredients, including fruit into a large mixing bowl. On low speed, gradually add yeast mixture, scrape down sides with rubber spatula. Knead on medium speed for 4 mins. Continue the kneading process until all ingredients are well mixed and the dough forms a ball. Place dough in a greased bowl, turning once to grease the top of dough. Cover and let rise in a warm place until doubled in size (approx 1 hr). Punch down dough and fold sides to the centre and turn dough over. remove the dough from the bowl and place onto a well floured surface. lightly knead the dough with the palm of your hands until smooth and elastic. Divide dough into 18 equal portion and shape into round smooth balls. Grease oven tray. position dough balls closely together on the tray. Cover for about 10-15 mins. For the crosses, combine the flour and water to form a batter and pipe crosses on the tops of the buns. Bake for about 20-25 mins until golden brown. Whilst the buns are baking prepare the glaze. Place the water, sugar and gelatin into a small pot and stir over medium heat until sugar has dissolved, approx 2 minutes. Glaze buns while they are still hot.